Chicken wings are a crowd pleaser. If there’s a big game or a party, my family loves to celebrate with a big platter of chicken wings. In the past, we would buy wings from a local wing joint, but they are so easy to make at home and much cheaper too. This list ranges in flavors, from sweet to tangy to spicy or savory. Enjoy! For more chicken wings recipes, follow my Chicken Wings Pinterest board. You can also follow all of my Pinterest boards for other recipe ideas and money-saving tips. Do you have a favorite chicken wings recipe? Share the link in the comments. Thanks for including my Chocolate Malta Chicken Wings. This is the perfect round up for a party. You’re welcome, Christie! Your recipe sounded so interesting and different that I just had to include it. We are big chicken wing fans in my household, and I can’t wait to try a number of these. Our current family favorite is a chile lime chicken wing recipe by Tyler Florence. I love Tyler Florence. I’ll have to go check out his chili lime chicken wings. Thanks for stopping by & commenting! Thanks for including my chili spiced mango chicken wings! Wings are a favorite at our house and we are always looking for new ways to prepare them, so I’ll be bookmarking this post. 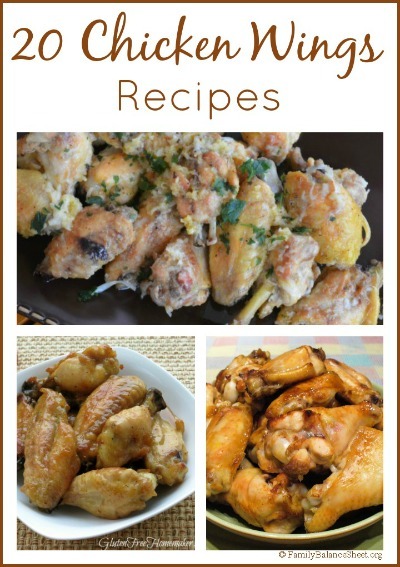 Thanks for compiling this list of chicken wing recipes! I’m crazy for a saucy BBQ sauce with a touch of sweetness. Jenna Em recently posted…Easy Chocolate Valentine’s Day Lollipops for 2! Share With a Friend Heart-sicles! You’re welcome, Jenna Em! Thanks for stopping by. You’re right about the difference in cost that comes with making it yourself. You definitely have enough recipes to keep your family and yourself fed for years to come.